Halloween is one of the easiest parties for which to decorate. You can literally stop dusting and use tattered household items for decorations! Set up a spooky atmosphere and your guests’ imaginations will take over. Is that red Kool-Aid over there? Nope, it’s the “blood of my enemies” and those aren’t frozen grapes floating in the punch. Use dark cloth, like a sheet or towel, to cover tables and countertops. Create extra mystery by using the cloth to cover your “To Do” pile instead of moving it – which can create many more mysteries later on. Put some scary music or sound effects on, but turn it down. Thinking you heard a strange sound is scarier than hearing someone shriek on a CD. Blacklights have become very affordable. Blacklight fluorescent bulbs work better than the incandescent type. White colored items and standard yellow highlighters glow brightly under a blacklight. You can create glowing objects by putting the highlighter felt in a container of water. Did you know tonic water also glows well under a blacklight? For snacks, put out a simple fruit, vegetable and/or cheese platter, but add some crackers with strawberry jelly. Dribble the jelly towards the center of the dish for decoration. Turn simple Spaghetti into a worm pie by decorating it with pepper and serving it in a small dish. Use a creative name when serving your main course to turn simple Ziti, Chicken Parmesian, or Meatballs into a dish fit for a monster. Dessert has lots of options, from cherry pie to shaped cookies and cup cakes. Simplify your party planning even more, let Nino’s handle the food. 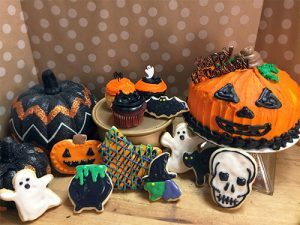 From a Jack-O-Lantern cake to Halloween decorated cupcakes and iced cookies, we’ve got you covered!